Home | Serigraphs and Giclee Fine Art | Bruce Ricker | Ricker Handsigned and Numbered Limited Edition :Deluxe Serigraph on Gesso Board:"Seasons of Light"
Ricker Handsigned and Numbered Limited Edition :Deluxe Serigraph on Gesso Board:"Seasons of Light"
About the Artist:Bruce Ricker redefines landscape art using a style that he calls epic visionary. A formal education in art and architecture combines with a lucid imagination to result in the unique Ricker style. The Ricker's style of painting, developed over many years, is rooted in his powers of observation. "First one must see the bones of a landscape, the three-dimensional molecular nature of rock in all its power and insistence: this is the foundation of any landscape." With this foundation, Ricker begins to introduce the effects of sunlight, wind and water; sensual patterns and textures emerge and flower further as they manifest the biological life. Over the years Ricker has built a language of shapes notable for their sharp detail and articulate precision, as well as their vision of nature more internal and mystical than photo-realistic. Ricker reminds us to look more closely; the final returns are not yet in on what this world is made of, or even what it really looks like. It is this borderline between the real and the imaginary, that Bruce Ricker explores-a fertile ground for seeing life in a newer, more interesting, and ultimately more meaningful way. 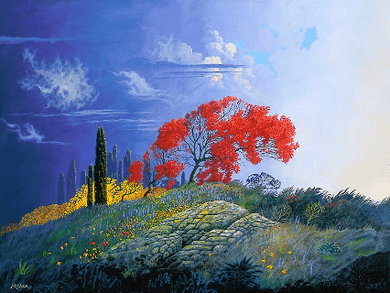 Home | Fine Art Prints & Limited Editions | Gallery Direct Art is your Authorized Chalk & Vermilion Dealer | Bruce Ricker | Ricker Handsigned and Numbered Limited Edition :Deluxe Serigraph on Gesso Board:"Seasons of Light"